Australia has some of the highest retail electricity prices in the world, but renewables aren’t to blame. Recent increases in both wholesale and retail electricity pricing has fuelled heated debate around the impact of the introduction of renewable generation capacity on energy consumers across Australia. Climate change and renewable energy sceptics have claimed that the intermittency, perceived unreliability, and cost of subsidising renewable generation like solar and wind is to blame for the medium-term increase in retail electricity prices, with a recent article explicitly pointing the finger at politicians with “insane global-warming policies” as the root cause of Australia’s pricing woes.1 This conclusion isn’t supported by market data and, in fact, recent analysis supports the fact that further increases in renewable generation capacity are actually expected to reduce wholesale electricity costs.2 Further, Australia’s renewable energy incentive schemes borne by retail electricity consumers make up a very small portion of the prices they pay.3 So, if renewable generation and Australia’s “global-warming policies” aren’t to blame, what is, and in which direction should we be pointing the proverbial finger? What contributes to retail electricity prices? Wholesale electricity – The cost of buying electricity in the wholesale energy market. The National Electricity Market (NEM) is a competitive “pool” or “spot” market where generators place bids to supply market demand. Retailers buy electricity in the market which they can then on-sell to retail customers. Network – Retail customers buy electricity that is delivered to a meter at their home or premises. This delivery occurs through the transmission and distribution system (the power lines) with the owner of those systems charging the retailer for the use of their assets. Environmental – Retailers are required to meet obligations under national and state-based schemes designed to reduce carbon emissions and support renewable energy. The cost of meeting these obligations is passed on to customers. Retailer costs – The cost of running the retailer’s business which includes acquiring and managing customers, sourcing and delivering electricity, and typical corporate “overhead”. Retailer earnings – Most retailers exist to make a profit for public or private shareholders, so the retailer charges a margin on top of its costs. A common misconception is that the wholesale cost of electricity is the largest driver of retail pricing, but this is not the case. In 2015–16, network costs were the largest component of retail electricity pricing, making up approximately 48 per cent of an average consumers bill.6 These costs have increased significantly over the last 10 years,7 with much of this cost passed down to consumers via the retail electricity price. 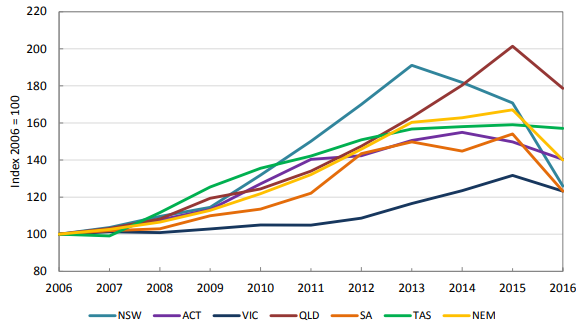 Environmental costs contributed just 7 per cent in 2015–16, with the majority of this cost driven by Australia’s Renewable Energy Target (RET) and state Government feed-in tariff schemes.9 Whilst it’s difficult to forecast a forward-looking environmental cost for consumers, the improving economics and increased penetration of renewables suggests that consumers will see these costs fall over time. Although the wholesale electricity price forms less than a third of the cost borne by a retail consumer, it is still a significant component and has had an impact on retail prices. So why have prices increased, and is solar and wind to blame? How are wholesale prices set in the NEM? To fully understand the cause of recent increases in wholesale pricing it is helpful understanding what the NEM (wholesale electricity market) is and how it operates. The NEM is a wholesale spot market for electricity.10 It operates as a pool market where output from large electricity generators is aggregated and scheduled to meet electricity demand in five-minute intervals.11 Generators bid a quantity of electricity at different price points into the market. These bids are arranged in order of price, from lowest to highest, by the market operator, the Australian Energy Market Operator (AEMO).12 AEMO dispatches the generators with the lowest-priced bid first, and continues to dispatch until demand for the interval is met. Over six consecutive five-minute intervals, the average of the highest bid required to meet demand sets the price for that 30-minute interval and all dispatched generators receive that price.13 In summary, wholesale NEM pricing is set by the highest cost generator needed to meet current demand. This marginal pricing mechanism generally means generators will bid a price that is low enough that they will be dispatched, but high enough to cover their marginal cost of producing electricity.14 For coal or gas generators, the marginal costs include the cost of fuel. For renewable generators, the marginal costs only include operating and maintenance costs. So, renewables like wind and solar can increasingly bid lower prices into the NEM to ensure they are dispatched, yet still receive the price for the interval set by the highest bid required to meet demand, which is more often coal or gas. Generators can also enter into financial contracts or hedging arrangements to manage the price volatility in the wholesale market. Power Purchase Agreements (PPAs) are an example of this type of financial contract where a generator and a wholesale buyer agree a mechanism which sets a particular price for a particular quantity of electricity. The physical electricity is still traded in the NEM but the PPA functions to fix a price or pricing parameters so that both buyer and seller eliminate or reduce exposure to the wholesale price. More on PPAs in another blog post. What has caused recent wholesale electricity price increases? The most recent rapid change in the balance of supply and demand in the NEM is the retirement of the Northern and Hazelwood coal-fired power stations in South Australia and Victoria, representing almost 2000MW of baseload electricity generation capacity.19 Whilst these generators had been historically low-cost to operate, both were older plants dating from the 1950s and 1960s and were requiring increasing maintenance expenditure to continue operations.20 The continued operation of these generators was deemed uneconomical by their owners and they were retired.21 This meant that generators that had previously bid higher prices than Northern and Hazelwood were dispatched more often and, in such intervals, the wholesale price increased. The other major contributor to increased NEM prices has been the increase in domestic gas prices, which have almost doubled from $3–$4 per gigajoule in 2012 to $7–$10 per gigajoule now.22 Gas generators often set the marginal price in the market and, as fuel prices increase, the prices gas generators bid into the market increase. Coal retirements have increased reliance on gas so more gas is dispatched at a higher price and, additionally, domestic gas supplies are further pressured. Australia has plentiful reserves of gas but much of it is exported as Liquified Natural Gas (LNG) under long-term contracts therefore constraining domestic supply and increasing prices.23 In the US, where domestic gas prices are lower, a combination of gas and renewables is replacing coal,24 and wholesale prices are much more stable. It remains to be seen whether current proposals to increase domestic gas supplies will have a flow-on benefit to electricity consumers in the short-term or just allow traders to benefit from the export-driven pricing. What's next for electricity prices? So, what does all of this mean for future electricity prices? At a wholesale electricity price level, current market expectations indicate that higher prices will continue over the medium term as more of Australia's ageing coal-fired power station fleet is retired. Supporters of coal suggest that building more coal-fired power stations will help, but in reality, coal capacity is more expensive than gas, solar and wind in most parts of Australia, so would likely have little downward impact on wholesale prices.27 Additionally, traditional equity investors and lenders are reluctant to finance new coal builds, preferring to invest in renewables.28 With large-scale battery storage economics still challenging in most applications, gas will be expected to complement the expansion of solar and wind capacity, so domestic gas supply and price is a critical indicator of wholesale electricity price direction. To the initial question, where should we be pointing the proverbial finger? Whilst there’s not one single determinant of sustained increases in retail electricity pricing, it certainly wouldn’t be fair to blame renewable generation capacity and “insane global-warming policies” for this change. If anything, this technology and subsidy program is expected to help drive retail costs down over the medium term. One sure-fire way to increase electricity prices moving forward is to export more Australian gas and build new coal-fired power stations.